Avaiable in 200 Colors. Add Color Name / Number before adding to cart). COLOR MAY NOT BE THE SAME AS SHOWN ON YOUR MONITOR SCREEN. Special Order Item. Not returnable. 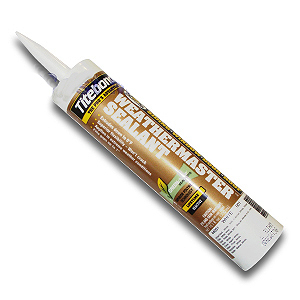 DESCRIPTION: Weathermaster Sealant is suitable for Siding, Windows, Doors and more. It's a high-performance exterior/interior Polyether sealant for use in both moving and non-moving joint applications. Paintable in about an hour. Easier to gun and tool in hot and cold weather. Composition: 100% solids, solvent-free formulated silyl-terminated polyether. 100% solids, solvent-free formulated silyl-terminated polyether. Solvent Content: Contains no solvents or V.O.C.’s.